Today and 2 days weather forecast for Ölüdeniz, Fethiye. Situated on the south west coast of Turkey, Olu Deniz is fortunate to receive a Mediterranean climate , that is hot, dry summers and warm, wet winters. 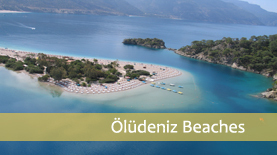 By British standards Olu Deniz and the surrounding areas only have two seasons, Spring and Summer! Temperatures in the summer months range from 30 , 40 degrees Celsius (86 , 104 degrees Fahrenheit) and in winter temperatures generally do not fall below 10 degrees Celsius (50 degrees Fahrenheit). The sea water never falls below 16 degrees in any season, so it is possible to swim in the sea 9 months of the year. 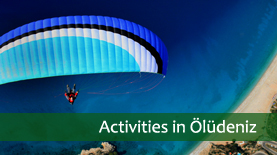 Spring holidays in Oludeniz see pleasant warm days, with between 8 to 10 hours of sunshine every day and average highs of 18C - an ideal time for both sightseeing and outdoor sports and activities. The weather heats up during May when the temperature reaches 20C, with average highs of 27C-28C in July and August, and the region receiving a massive 13 hours of sunshine. Olu Deniz sees occasional highs of 30C and above, with these very hot days an ideal time to take to the water and enjoy the many boat trips and gulet cruises along the stunning coastline, or visit the local beaches. 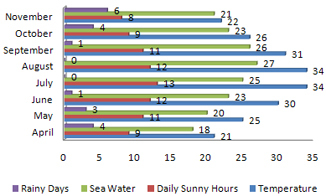 The average water temperature is 23C during the summer, and even during the winter it rarely drops below 16C. Rainfall in the summer is generally light, with the period from May to September being the driest. Autumn sees plenty of sunny days, and pleasant highs of between 19C-24C. Winters in Oludeniz are mild, with an average temperature of 11C, and the months of January and February being the coldest, dipping to 10C. The period between November and February sees the wettest weather, with most rain falling in December and January, and the region receiving around 1,100-1,500mm every year. Oludeniz still stays sunny and bright during the cooler winter months, seeing a minimum of 5 hours of sunshine even during the coldest months of December and January.